Due to graphene's 2D geometry, most of the device applications require graphene to be partially or fully supported by a substrate, which is typically silicon dioxide (SiO2). 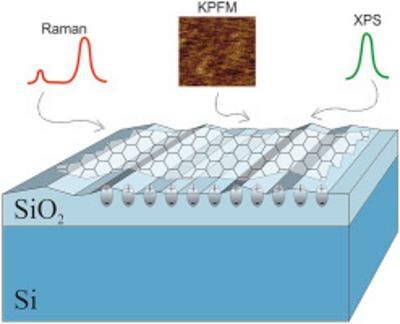 An important example of a typical graphene structure on SiO2 is the graphene field effect transistor – GFET, a sheet of graphene connected to metal terminals on the planar substrate. The current common understanding is that graphene interacts with SiO2 through weak, long-range van der Waals forces, even though experimental evidence suggests a surprisingly strong interaction between graphene and SiO2 that affects all properties of the device. Now, a multinational research team from the University of Trento, Italian Space Agency and Fondazione Bruno Kessler in Italy, Graphenea in Spain, Institute of Chemical Engineering Sciences and University of Patras in Greece, and Queen Mary University of London in the UK has shown that surface charges on the oxide are a main factor of strong interaction between graphene and SiO2, paving the way for designing 2D material interaction with a substrate through manipulation of surface charges. Such control of graphene-substrate interactions would facilitate the development of new graphene-based microelectronic devices. Employing several experimental methods, mainly Raman spectroscopy, Scanning Kelvin Probe Microscopy, and X-ray Photoelectron Spectroscopy, the scientists studied graphene deposited on different types of silica surfaces, revealing that each of those substrates interacted with graphene in proportion to the amount of surface charge, indicating an electrostatic interaction. Raman analyses showed a shift in the characteristic spectral peaks in graphene on different substrates, whereas the other two methods clearly demonstrate different surface charge concentrations and valence band bending (due to electrostatic doping) across the different samples.